RoboSHOT® 40 UHD is an outstanding broadcast-quality PTZ camera with 40x zoom, genlock capabilities, smooth motor movement and superior 4K image quality – all at a surprisingly competitive price. Meet the newest member of the AV Bridge family. AV Bridge Mini is the easy way to encode, capture and stream – in a convenient, compact half-rack size. Ideal for large meeting rooms, lecture halls and houses of worship, PrimeSHOT™ 20 HDMI provides 20x zoom, 1080p image quality and outstanding low-light performance – all at an exceptional value. Discover an easy way to bring multiple-camera live event production to UC applications. AV Bridge MatrixMIX is a multipurpose, easy-to-use switcher that’s ideal for live events, lecture capture, training sessions and more. Perfect for small conference rooms and huddle spaces, the razor-sharp image and extra-wide field of view on this fixed camera allows everyone around a table to be clearly visible. Bridge It. Extend It. Stream It. OneLINK Bridge AV Interface combines a camera extension system with an audio mixer into a single device – so you can turn any pro AV source into a USB 3.0 media stream and use it with popular cloud conferencing solutions. The Vaddio ConferenceSHOT AV brings video conferencing to a new level with sharp USB 3.0 and IP streaming video and direct microphone and speaker connections for powerful, clear sound. Discover Vaddio's newest technology for intelligent presenter tracking. Optimized for large venues on a small venue budget, RoboTRAK's precision video enables instructors to focus on teaching, not technology. Enterprise class camera controller for anywhere, anytime management. Combining 4K video technology with the Art of Easy, Vaddio’s new Ultra HD PTZ camera delivers extraordinary resolution, superb color reproduction and unmatched price/performance. High Definition PTZ Broadcast Camera Featuring 30X Optical Zoom Lens and Tri-Synchronous Motion with simultaneous HDMI, HDBaseT, and IP (H.264) streaming outputs. High Definition PTZ Conferencing Camera Featuring Tri-Synchronous Motion and 12X Wide Angle Lens with simultaneous HDMI, HDBaseT, and IP (H.264) streaming outputs. Vaddio is launching the RoboSHOT 40 UHD, a broadcast-quality PTZ camera with 40x zoom, genlock capabilities, smooth motor movement and superior imaging. The RoboSHOT 40 UHD was designed with a genlock external sync port to provide accurate synchronization in multi-camera broadcast environments, plus phase compensation to fine-tune and adjust the genlock signal. Vaddio is launching the new AV Bridge Mini, first introduced at InfoComm. The AV Bridge Mini HD Audio/Video Encoder makes it easy to encode, capture and stream content. It provides the popular features of the Vaddio AV Bridge and AV Bridge Conference in a new compact half-rack size along with several important updates. 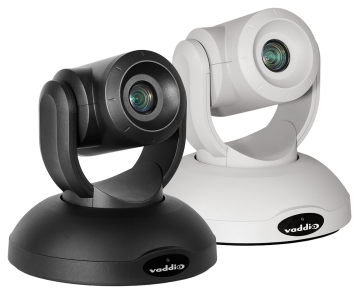 Vaddio recently launched the RoboSHOT Elite Series of professional PTZ cameras, ideal for university lecture halls, houses of worship, government chambers, corporate meeting rooms and more.